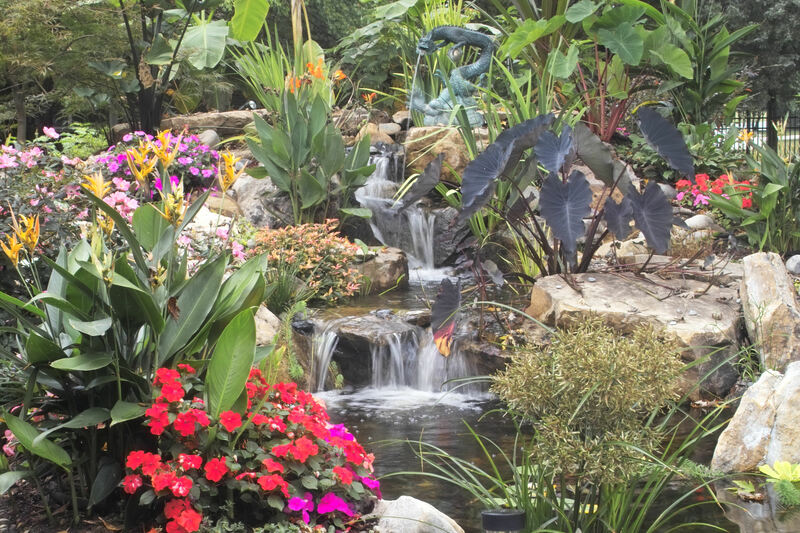 Here at American Aquascapes we take great pride involving our customer’s dreams and our company’s expertise to create the ultimate back yard paradise. Founded in 1996, American Aquascapes is an award-winning, professional pond service business. Located in Graham, North Carolina (Near Raleigh & Chapel Hill) we have provided North Carolina, Virginia, Tennessee, & South Carolina with affordable water feature designs, construction, maintenance, and repairs. We design one of a kind water features, using a collection of the most elegant stone available today with certified state-of-the-art products and the creative talents of our designers at American Aquascapes. 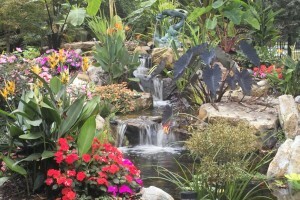 Over the past 15 years we have supplied hundreds of residential customers and businesses with unique water garden features. Whether you are looking to have a simple rushing water fountain, a complex koi pond with a peaceful waterfall, or maybe even a pondless waterfall, we are the team to bring theses dreams to life. A Little History About Our Company . . . In 2001, American Aquascapes took 3rd place in Recognition of Excellence at Greensboro, NC in a 600+ square foot exhibit. 2002 we were named the 118th Largest Installer in the United States, then jumped to the 77th Largest Installer in 2003. American Aquascapes also ranked 1st place in Excellence at the Greensboro, NC’s Southern Woman’s Show in 2003. In 2004 we took the tittle of being the 50th Largest Installer in the United States. 2006 we received the “Top Frog” Award and were also given a Certificate of Completion in the Pondless Waterfall Building Contest. Our company became a Certified Aquascape Contractor in 2008. 2011 American Aquascapes became a Certified Aquascape RainXChange Professional Announced by Smith Turf & Irrigation a Certified Member of the President’s Club in Recognition of Outstanding Performance as a Landscape Contracting Professional. 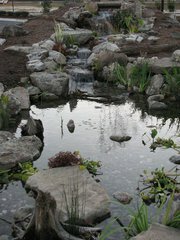 Featured in the January/February 2011 Water Garden News, American Aquascapes helped Capital Bank of Hope Mill, NC “Go Green”. We designed a 15,000-gallon rainwater harvesting system to collect rainfall from the bank’s 5,000-square foot roof. The bassin had to be 20 feet by 25 feet by 6 feet to collect the average 15,000 gallons of monthly rainfall from the roof. Our company also participated with 40 Certified Aquascape Contractors to build a 50,000 gallon per hour waterfall for NASCAR’s Richard Petty’s “Victory Junction Gang Camp” for children with chronic medical conditions or serious illnesses. The waterfall was named”Victory Falls for the Kids” and is still just as beautiful as the day it was built. So as you can see, we have made a great name for ourselves over the years – Let us help you create your perfect pond paradise . . . It’s what we do best!